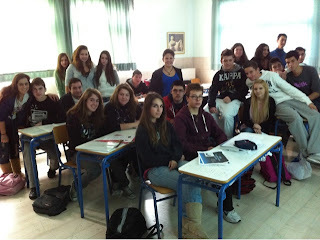 I @ilotimo had a unique Comenius project planning meeting in Athens Greece 8.-11.12. My school Voionmaa upper secondary school from Jyväskylä (video: 28 hours in Jyväskylä) , Finland participate this project together with Greek, Lithuanian, Germany and Italy. We are applying this project in February, the big theme is parks in different countries. In Finland we are talking about national parks. We had sudden possibility to join the project thanks for Twitter and my Greek teacher friend George Panagiotakopoulos @Physiart, who asked couple months ago in Twitter to join the project and suddenly i was on my way to Athens with two colleagues of mine, geography teachers Laura Sallinen and Kimmo Puttonen @kputtonen. In Zohs school Athens we met just fabulous group of students, who where studying with project based learning about Cosmos and CERN - the European Organization for Nuclear Research. There has been national program of using PBL in every school in Greece. We had also used PBL a lot in Finland upper secondary schools, mainly in entrepreneurship studies, so we had lot of common practice and experiences to share with those super active students. I asked them about what their have learned in project based learning in 20 hands flew up simultaneously and they talked they story straight to three Finnish teachers hearts. We felt remarkably enthusiastic response. Their had learned teamwork, respect each other, making decisions, set up a goal together, to talk also difficult things, cooperation in all levels. Their also asked a lot of about Finnish education, our students, teachers, schools and then was our privilege to tell our story to these wonderful students. Cultural sharing at its best. We are now planning Skype seminar about CERN together with Finns and Greeks in January. Thank you so much for this recap of your visit to Greece - I am happy and was sure you would have a great time! A great Animoto of George's class. I wish you both all the best! I have read your interesting blog related to education mats . These are very interesting facts covered on this blog. So What is It about Finland’s Schools?